Register Log In AmbergrisCaye.com Home Forums Nature Something Fishy is Happening at the Reef! Researchers have found that only 10% of the Belize Barrier Reef wildlife has been discovered! Belize may be a small country but it holds the largest cave system of Central America and the second largest barrier reef in the world. With over 500 species of birds, 400 species of subtropical fish, and 900 Mayan historic sites, the country embraces a rich culture with biodiversity unlike any other around the globe. In 2009, the Belize Barrier Reef was named a United Nations Educational, Scientific, and Cultural Organization, or UNESCO, World Heritage Site in Danger. The 900 sites entitled in danger are highly significant to humanity for its cultural and natural characteristics. The World Heritage Committee supplies resources and plans treatment programs for sites in danger of devastation or complete demolition. The sites around the world vary in geography and sizes ranging from monuments to lakes. 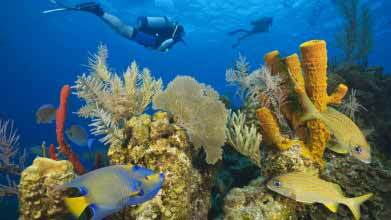 The Belize Barrier Reef is among one of them because of problems associated with natural environment events, human activity, and pollution. These occurrences destroy natural habitats of many species including the parrotfish and surgeonfish, and stunt the growth of endangered populations. A Nassau Grouper weighs over 50 lb. and is one of the largest fish of the reef. 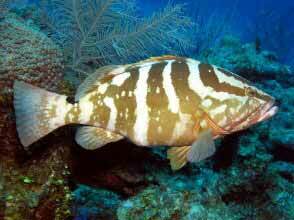 The Nassau Grouper was once a flourishing fish species found in the western Atlantic tropics and along the shorelines of central and northern South America. It was considered a prized food source and was one of the most valuable exports of Belize. According to ReefCheck, out of 162 reefs that were studied by underwater census, 7 housed many Nassau Groupers, 12 housed one and 142 housed zero. Commercial fishing has dramatically decreased the population by approximately 60% over the past three generations, making it a candidate of the U.S Endangered Species List. To control the dwindling numbers of the Nassau Groupers, Belize must enforce stricter rules and regulations to minimize or ban fishing in the western North Atlantic and Caribbean waters. Banning the sale and exportation of the fish will control the need for the groupers and the amount of fishing will decrease. The Parrotfish’s teeth grow continuously and it is able to product 200 lbs of sand annually! The IUCN Red List of Threatened Species has conducted a research on the parrotfish and surgeonfish and has found that 86% of the species are at high risk of extinction regionally. The existences of the fishes are significant for the reefs since they feed and maintain the amount of growing algae. An uncontrolled growth of algae is capable of engulfing coral reefs destroying the homes of juvenile fish and the reef itself. 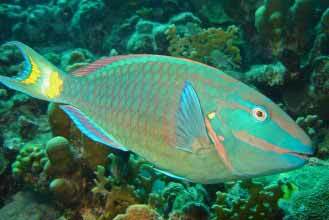 The weed-eating parrotfish and surgeonfish are species that are heavily fished like the Nassau Grouper. Countries where the fish roam, such as Belize, have made restrictions to protect the population and limit commercial fishing but further action and research is required. Marine Biologist Doug Rader of the Environment Defense Fund states “Coral Reefs and coral reef fishes all over the Caribbean are disappearing very rapidly. More than half are gone now. In some places the fish populations on the reef are just a bare vestige of what used to be there.” The once widespread numbers of beautiful fish that populated the Belize Barrier Reef have come to minimum and conservations such the Wildlife Conservation Society have made relentless efforts to protect and save endangered species. You can take part in the progression towards saving fish species such as the parrotfish and Nassau Grouper by visiting Wildlife Conservation Society at http://www.wcs.org to make a donation. You can also become a member of the WCS Wildlife Protectors to make monthly contributions or become a conservation patron by donating a specific range amount. There are four levels of patrons: protector, sustainer, guardian, and advocate. Each level of patron receives special benefits and access to the WCS facilities along with personal tours of the zoos and aquariums.